Help Build An Oyster Reef in the Severn River! 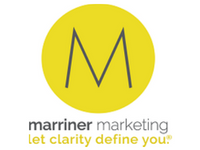 We are drawn to its shorelines… We find enjoyment in boating, fishing, and exploring its waters. We are homeowners, business owners, and citizen leaders who rely on the opportunities and sense of community it provides. We depend on the Severn River, and – now more than ever – the Severn needs our help. 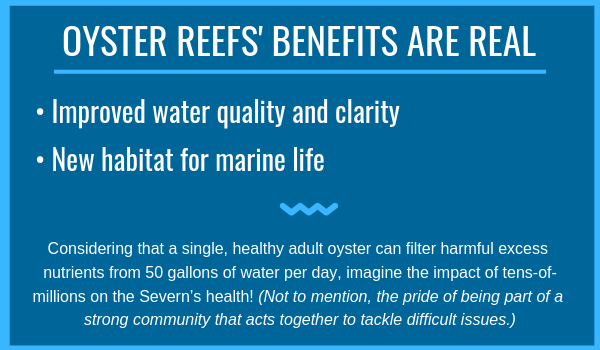 This July, with your support and the generosity of the surrounding community, let’s raise $50,000 to plant 10 million water-filtering oysters in the Severn. 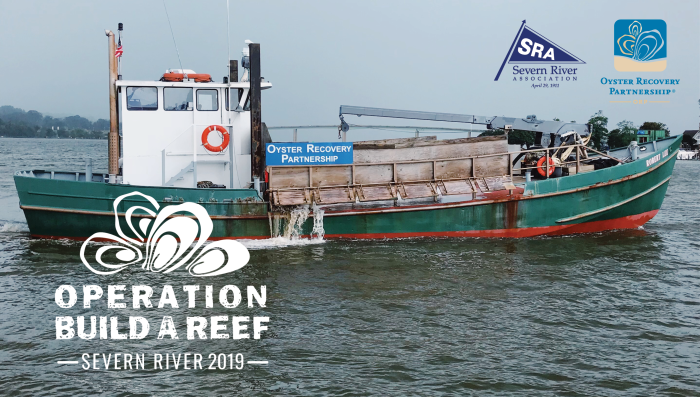 Every donation to Operation Build-a-Reef, no matter the size, directly supports the production, transport and planting of baby oysters in the river. To reach the 10-million oyster goal, please consider purchasing a bushel of spat-on-shell for $100, each containing thousands of baby oysters. The Severn watershed drains a large, densely-populated area. As a result, our communities experience erosion, degraded water quality, and other pressing issues. Anne Arundel County is working hard on land-based clean-up efforts. Your sponsorship enables the planting of water-filtering oysters to help repair the river from within. Operation Build a Reef expands upon significant progress made during the summer of 2018, when over 47 million oysters were planted on protected oyster sanctuaries between the Severn River and Naval Academy Bridges. It is a collaborative partnership between the Severn River Association and the Oyster Recovery Partnership. As friends and neighbors, businesses and community organizations, let’s do more than imagine a healthy Severn River… let’s make it happen! Donate here – and please share information about Operation Build a Reef with your network.